Affinity purified against phosphor specific peptide. 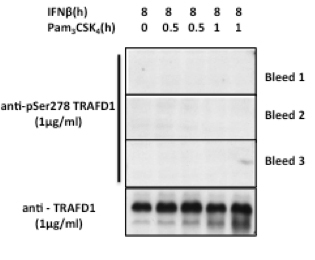 Immunoblotting after immunoprecipitation: Second and third bleed can detect TRAFD1 phosphorylated on Serine 278 after immunoprecipitation from RAW 264.7 cells.RAW264.7 cells were treated with IFNβ (50U/ml) for the indicated times (to induce expression of TRAFD1) followed by stimulation with Pam3CSK4 for the indicated times (to induce activation of IKKε/TBK1 and subsequent phosphorylation of TRAFD1). TRAFD1 was immunoprecipitated overnight from 1mg of lysate using 2μg of anti- TRAFD1 (S327D) coupled to Protein G-Sepharose beads. Anti-pS278 TRAFD1 was used at 1 μg/ml overnight at 4°C in 5% BSA in TBS-Tween followed by secondary incubation with anti-sheep HRP at 1 in 5000 from stock for 1h. As a control for TRAFD1 induction, non-phospho anti-TRAFD1 (R3102) was used at 0.1μg/ml. Only bleeds 2 and 3 readily detected phosphorylated TRAFD1. Immunoblotting without immuunoprecipitation: Do not use for immunoblotting without immunoprecipitation of TRAFD1. 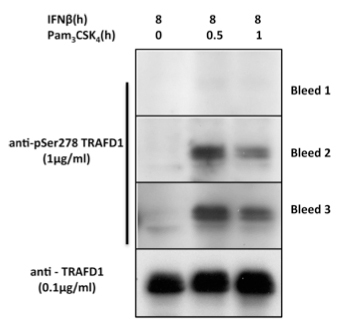 RAW264.7 cells were treated with IFNβ (50U/ml) for the indicated times (to induce expression of TRAFD1) followed by stimulation with Pam3CSK4 for the indicated times (to induce activation of IKKε/TBK1 and subsequent phosphorylation of TRAFD1). 25ug of protein was run on a polyacrylamide gel. Anti-pS278 TRAFD1 was used at 1μg/ml overnight at 4°C in 5% BSA in TBS-Tween followed by secondary incubation with anti- sheep HRP at 1 in 5000 from stock for 1h. As a control for TRAFD1 induction, non- phospho anti TRAFD1 (S327D) was used under the same conditions.